During my undergrad studies, I had one class in particular that encouraged me and my fellow classmates to question fundamental values such as peace, equality and freedom. Since the professor was a self-proclaimed, fearless feminist who loved a good philosophical debate (Hi, Gun! ), I always felt comfortable and safe to make other people question their values and views when debating issues regarding gender identity and sexual orientation. One day we were discussing gender equality at the societal level and; of course, there were these two guys who mansplained to me the “natural” differences between the sexes after I had explained to them that gender was a social construct and not an inherent human characteristic. The debate kept on going and so they kept telling me I was wrong because women and men are “naturally different”. What’s tragic though is that, at the end, they told me they called themselves allies to the gender equality movement (because God forbid they called themselves the F-word!) and that we were working towards the same goal. Since that hopeless discussion, and in my own journey as a feminist with a passion and curiosity for social justice, I have always wanted to know more about what it really means to be an ally. Last week I had the opportunity to explore this topic more in depth by facilitating a discussion about “how to be a better ally” in our biweekly Everyday Feminism Team meeting. In the discussion, not only did I learn more about being an ally through the research I had to do, but also through the beautiful and rich ideas my fellow feminists shared with me. I want to share my reflections on the topic here. But before you read any further I want to say two things. Firstly, a BIG THANKS to those who participated and shared extremely insightful, complex and articulate ideas about their experience as allies and as feminists; and for the support in my first facilitated discussion over Skype. Thanks to Sandra for the opportunity to facilitate the discussion. Secondly, the research used in the discussion is the same research that is used in this blog post and credit will be given where it is due. Most of my research was based on amazing ideas from Jamie Utt, Mia McKenzie from Black Girl Dangerous and articles from Everyday Feminism. So, maybe it is because we are genuinely passionate about a certain cause (like the feminist, queer or environmental movements) or because we want to do some good and feel good about it, we have probably said in the past that we support a certain cause or we are an ally to it. And perhaps announcing it to others, or “talking the talk” as some people say, seems like enough for most of us. But this is not really enacting social change. We need to actually walk the walk to have some kind of impact in the field of social justice; and to achieve this, we need to ask ourselves, what does it mean to be an ally? Do we even know what an ally is? Drawing from the works of Jamie Utt and Mia McKenzie, allies are people of identity privilege who consciously act against the systems that afford them privilege because they are aware of how these systems oppress and marginalise other groups of people in our society. Being an ally requires daily actions that undermine and challenge the social norms that make up for today’s status quo. Foucault explains how social norms exert disciplinary power on a certain population and how, in turn, this further dichotomises identities. As individuals internalise and condition themselves to act and think in certain ways, some practices, discourses and identities are reproduced and so they are considered ‘normal’ or more ‘acceptable’ than others. This creates dichotomies like normal/abnormal, natural/unnatural, subject/object, privileged/oppressed and so on. As such, those that internalise, act and are born in a circumstance that ‘fits in’ with the norm will benefit from social and identity privileges. The status quo is maintained because power is relational (which means everyone is an instrument of power) among individuals and institutions in our society. People internalise norms that contribute to this status quo. Since power is literally everywhere, Foucault believed that the status quo and its norms can be changed when people challenge norms and the institutions that reinforce them. I see it as a way to disrupt the current cycle of norms and try to create another one, but that’s just me. Allies, as instruments of power (in my Foucauldian terms), need to be in a constant battle against these social norms since they oppress certain groups of people while privileging others. The best way to do this, before taking any other step, is to become aware of one’s privilege. This is one of the most difficult tasks that we, as allies, need to fulfil. Checking our privilege entails questioning and analysing how we are advantaged in society by any of our multiple identities. Identities that are considered majoritarian and privileged such as white, male, cisgender, heterosexual, able-bodied and wealthy are considered the norm; and as norms, they have the power to exclude those that do not fit in. As Jamie Utt explains, as allies, the only way to change these norms is to purposely work against them. Knowing the way in which privilege advantages us will allow us to understand our placement in our society’s power structures, clarifying the way in which we can act in solidarity with others. This is an important realisation since privilege hides itself from the eyes of its beholder as the privileged is the norm. 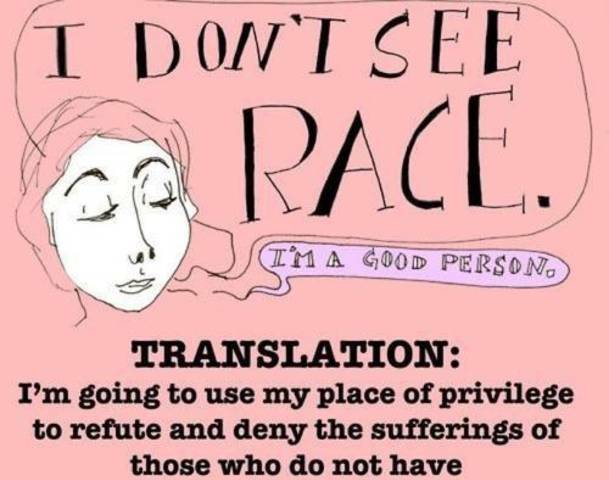 I don’t see race – I don’t see my privilege. Credit: Feministwire. A lot of people feel shame and privilege guilt when checking their privilege for the first time. This is okay, I went through it myself. It is pretty overwhelming to realise how one’s identities can contribute to the oppression of others. But we need to move past this. If we really want to be a part of social change, we need to act. We need to accept that we can’t really give our privileges away and feeling guilty and shameful only paralyses us in a state of inaction, which contributes to oppression by maintaining the status quo! This is NOT what we want as allies. To prevent the powerlessness that comes with (un)learning your privilege and to move past privilege guilt, keep in mind that it’s not your fault you have certain privileged identities. It’s pointless to feel guilty about something you can’t really change. However, you should feel guilty if you have checked your privileged and just sit there feeling bad instead of taking some action. You shouldn’t guilt-trip yourself over being heterosexual, or being white, or being wealthy. You are not a bad person. Oppression is systemic, not individual; but it is reproduced with individual actions. You should, however, become conscious about your place within society’s power structures and the impact of your actions. This way you can devise ways to become a more inclusive and empathetic person. Again, understand your role in oppression. Quoting Jamie, “understanding the fundamental ways in which I, as a person of privilege, collude with oppression every day, empowers me to act”. In desperation, my mentor Mark Spokes always referred me to the Serenity Prayer. I am not religious, but it makes you reflect a lot about what you can realistically change with your actions so you invest your energy where it is necessary. Burn-out effect is not fun. As Frances E. Kendall says, question your privilege by asking questions such as “what does it mean to be ________ in this situation?”, “if I were to be _________, would I be listened to?”. This leads me to the second most difficult task that we need to perform as allies: to really listen. Listening as an ally is more than just listening to one person of a marginalised group and calling it a day, because this person does not represent the stories of every person of that group. Listening as an ally is more than being friends with a person of a marginalised group and say I’m not homophobic or racist or classist because I have a friend from a certain group. Listening is just another way of challenging current relations of power. As Jamie Utt explains here, having identity privilege comes with the assumption that our worldview is (or at least should be) right, simply because we are the norm. And refusing to listen to those who are different from us is just another mechanism of silencing them. This silencing is done to remain in power and this silencing reproduces oppression. If we really listen, we are opening our hearts and minds to someone else’s perception of the world. We are recognising their full humanity by acknowledging that their voice, even if different from ours, is equally valid and worthy of listening. Listening sometimes means leaving one’s ego behind and accepting that the role of an ally is not to be the centre of the movement or cause they support, but to facilitate and respect safe spaces for marginalised voices to be heard. Most importantly, listening as an ally is to know that an ally’s place is not to talk over or act on behalf of people from a marginalised group, it is merely to recognise the power of their voice and their full humanity. Listening means to be genuinely open to learn the unique experiences of a person and to unlearn preconceived assumptions, negative and positive stereotypes about a certain group of people. Listening means learning to accept that we will be called out on our privilege and that we need to apologise for it. We become better allies by trying to do better after someone called out our privilege. If we make a mistake, we need to apologise for it and truly listen. We don’t need to get defensive about it because it is most likely that we messed up. It is part of our learning experience on listening to other voices. To be able to really listen, sometimes we need to shut up. Plain and simple, like Mia McKenzie says here. Once we recognise how our voice as privileged people has so much importance in our society, we need to shut up to give other voices the space they need to be heard. To facilitate the process of listening and to always keep our privilege checked, as allies, we should never take credit for the work of people from marginalised groups as our own. Those people have tried for a long time to get their voices heard, it is not fair for us to take advantage of our privilege and promote their ideas as our own. This only reinforces oppression as the privileged come up with all the solutions for those who are marginalised (Ugh). Those are not your words or actions, so why would you say they are? As allies, we need to know that we are not the centre of the movement or cause we support. It is not about us. It is not about how we feel. It is not about how this can be convenient for us. It is about furthering the reach of voices that have been traditionally marginalised and inspiring others to take action towards a more just society. It is about supporting the work and the voices of those you are allies with, not about being the spotlight and centre of attention. 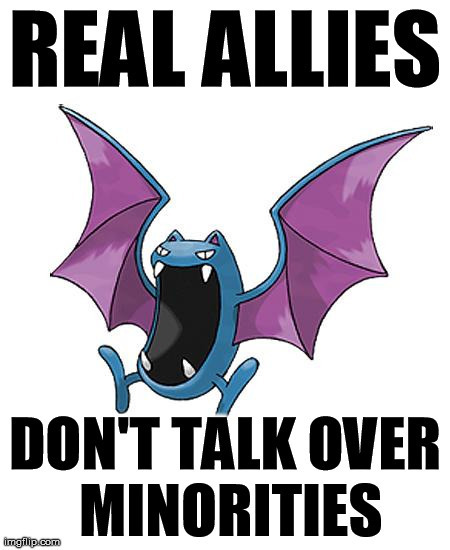 As allies we do not proclaim ourselves as allies. This is just weird. As Jamie points out here, those who we want to ally ourselves with must make that call based on how much they can trust us as allies. And, we can’t just say “oh, we are allies to this” because being an ally is about acting, not about our intentions (because intentions don’t have impact) and certainly not about the fanciness of the title. We are always becoming allies through our actions. We must know that we can’t just pick and choose when it is convenient for us to act as allies. This is taking advantage of our privilege since we can choose when to act or not act against oppression. As Jamie Utt points out here, people of marginalised oppression do not take breaks from being oppressed! This is something I personally struggle with because sometimes I feel it’s going to be a lost-battle trying to make a point about racism or homophobia with some of my friends (or even extended family!). And even though I am all for getting to know my energy levels to choose when to deal with this stuff, I want to have more courage and engage in these situations more often. Courage is important because the most effective way of being an ally is to to talk with people that share our identity privilege about the struggle of marginalised groups. This might offend the people with privilege since they might have never been called out before! I did this when I called out a friend of mine for being transphoic. As a cis woman, I tried to help my cis friend to understand why transgender is just another gender in the gender spectrum. As allies, we need to know that we are in a never-ending learning process. We need to be on top of our game and to do this we need to listen and we need to read. Yes, we need to read and educate ourselves. We need to inform ourselves about current affairs and the history behind oppression (capitalism, anyone?). We need to know about patriarchy and, more specifically, kyriarchy. It is necessary that we educate ourselves about intersectionality. This way we can understand how people experience the intersections of oppression and privilege in different ways and how this disproportionately affects others. For example, within the feminist movement, White Feminists need to learn how to be better allies to Women Of Colour by amplifying their voices and their work. As my fellow feminist Sarah Glassman pointed out in our discussion last week, we need to learn how to be better allies within our movements. Within the LGBTQIA+ movement, class-privileged white gay males are the population with more advantages and there needs to be space for recognition and support for other individuals that identify as trans*, bisexual or asexual, for example. There are power dynamics in every circumstance we find ourselves in, and we always need to think how to be better allies in such situations. 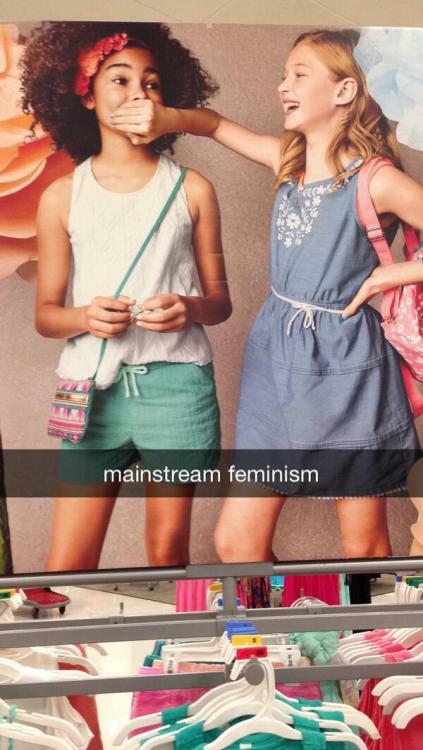 Mainstream Feminism – Credit: Tumblr. This post is long enough already (Oops! ), I just recommend reflecting about the groups you want to ally yourself to and how small actions can have a big impact. For example, asking for the preferred pronoun of a person, becoming aware of the language we use and how words can hurt people, what media we are consuming and the need to expand it or not to mansplain are good places to start, depending on your identity.